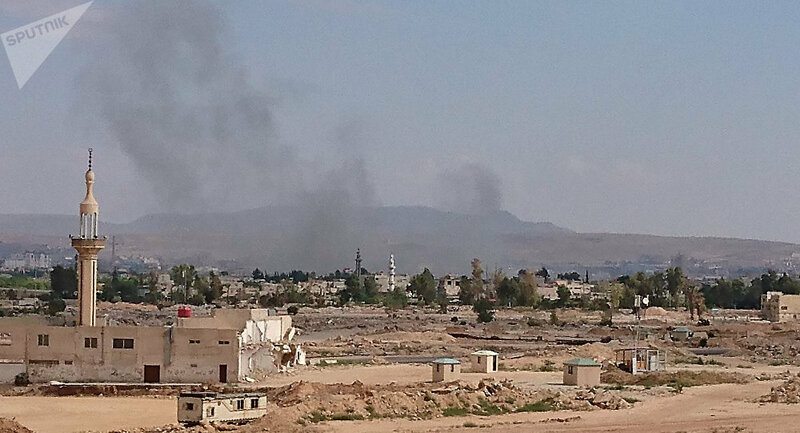 Repeated blasts were heard from the direction of Syria’s Mazzeh Military airbase near Damascus on Sunday, Reuters reported. ​The source specified that Syrian air defense systems had repelled the airstrikes. The Times of Israel newspaper reported, citing sources, that the strikes had been conducted by Israeli aircraft. According to media reports, the Mazzeh military facility was targeted by Israel in 2016 and in 2017, although a military source cited by Syria’s SANA news agency has refuted claims of Israeli airstrikes, saying that explosions at the airbase were caused by a short circuit. In May, Israel hit dozens of Iranian targets in Syria after Iranian forces allegedly fired 20 rockets at Israeli positions in the Golan Heights. Tehran has denied having military bases in Syria. Israel has also repeatedly expressed security concerns over the Iranian presence next to its borders in Syria. In early August, Iranian Foreign Ministry spokesman Bahram Qassemi said that the fight against terrorism was one of the tasks of the Iranian forces in Syria, adding that Tehran would maintain its presence in the war torn-country as long as Damascus wants it to. However, Bahram Qassemi also stressed that Iranian forces could decrease their presence in Syria and even end it after the situation in the distressed country normalizes and the fight against terrorism brings significant results. In July, the Iranian Supreme Leader’s top adviser for international affairs Ali Akbar Velayati said that Tehran would be present in Syria and Iraq at the request of these countries’ legitimate governments and would not leave despite US threats. Israeli Defense Minister Avigdor Lieberman said in August that Syria was seeking to reinstate the country’s army to pre-war levels and even increase the number of its forces, stressing that Israel was ready for any scenario. Israeli-Syrian relations have been strained, particularly over the disputed Golan Heights. Israel occupied the region after the 1967 Six-Day War with Syria and annexed the territory in 1981. The international community has not recognized the annexation.